Imagine one day your pet ravenously devours his or her bowl of food, but the very next day he or she cannot even palate what’s on the menu. Sure, he or she could be tired of the same old offering, but it’s also entirely possible that your pet is suffering from the ill effects of poor dental health. Now you may start to wonder how long that bad breath has been around…Don’t worry, it’s not too late to get your pet’s dental care practices underway, and your team at Beverly Hills Veterinary Associates are here to help. Poor dental health (that is, neglecting the teeth and gums) can result in periodontal, or gum, disease. Plaque, caused by high bacteria levels in the mouth, and tartar, also known as calculus, attach to tooth surfaces. When the bacteria from plaque and tartar seep beneath the gums, supporting tissues can be irreversibly damaged, and can even lead to tooth loss. Oral bacteria can also cause a severe inflammatory response, not only speeding up the deleterious effects of gum disease, but after entering the bloodstream, the bacteria can affect the health of your pet’s heart, kidneys, and liver. Specific diagnostics can help us understand how far-reaching your pet’s dental problems are. There are four stages of periodontal disease, and while we try to evaluate the best we can during a routine check, the proper way to assess and treat your pet is with general anesthesia. Even if your pet is young and doesn’t show any signs of dental problems, now is a great time to get him or her accustomed to proper dental care. A large majority of all pets over age three have periodontal disease in one stage or another; schedule your older pet’s appointment today so we can help you get started caring for his her teeth. Regular examinations, professional cleanings, and at-home care can help protect your pet from periodontal disease. Using pet-friendly toothpaste and a specially designed pet toothbrush, aim to brush your pet’s teeth several times a week. We are happy to share any pointers with you for your success. 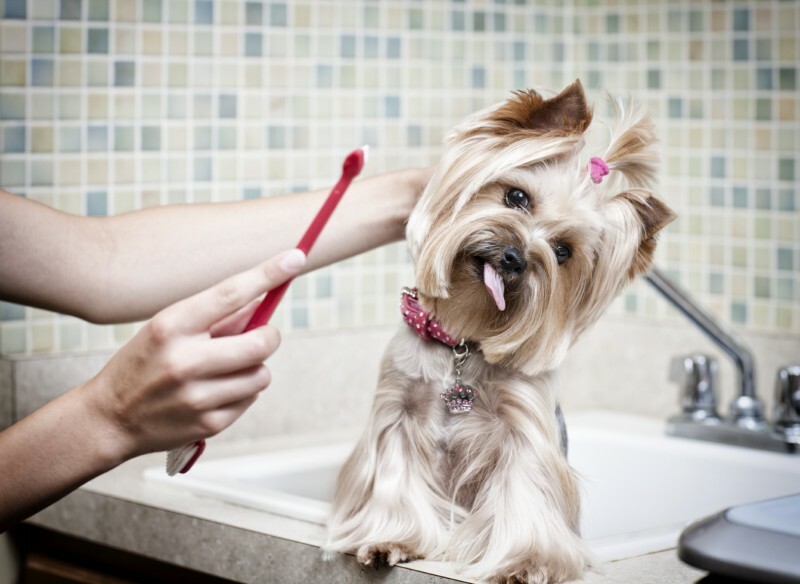 Your pet’s dental care is just as important as complete nutrition and physical exercise – and the long-lasting advantages simply cannot be beat. Our veterinarians and staff are always here to support the health of your pet. Please give us a call with any questions or concerns!